As more and more people discover the benefits of yoga, the 3,000-year-old practice is increasingly finding its way into the workplace. 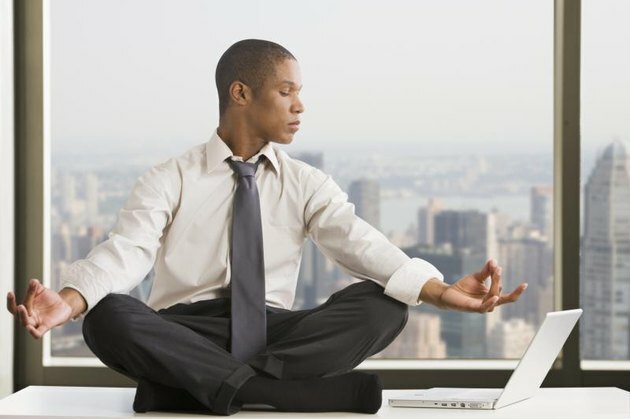 In fact, the demand for corporate yoga has created whole squadrons of yoga teachers who specialize in office settings. The benefits of providing yoga and other mindfulness activities during lunch-hours or breaks are probably obvious to anybody who already does yoga, but a lot of them are backed up by research. If you're considering bringing yoga into your business — or trying to talk your boss into providing classes — knowing about these benefits might pave the way for future office-sponsored Down Dogs. One of the main reasons many people take up yoga is back pain, which is one of the most common workplace complaints for people with desk jobs. A 2012 British study published in the journal Occupational Medicine proved the point with an eight-week study that drew participants from a government office. It gave one group a single 50-minute yoga class a week while allowing a control group to sit on their keisters. Surprise, surprise — the yoga group reported significantly less back pain and lower stress, as well as greater self-assurance, serenity and concentration. By comparison, the sedentary control group reported more hostility, sadness, stress and back pain. Worker productivity keeps going up. Why? Maybe it's because of the people who have jobs, many do the work that used to be done by three people. Hence, we have the problem of burnout — and the solution of yoga. Just ask nurses, who work weird hours and under a lot of stress. A 2015 study published in Workplace Health and Safety found that nurses who performed a weekly yoga session for eight weeks experienced enormous reductions in warning signs for burnout. Among the benefits are higher levels of self-care, less emotional exhaustion and a reduced tendency toward depersonalization in their contact with patients. Any workplace that functions harmoniously is likely to be more productive. A controlled study in the journal Ayu of 160 workers at an engineering firm in India, yoga was shown to reduce hostility and aggression. In the study, half studied and practiced yoga for one hour daily, while the other half received lectures in management theory and engaged in light exercise for the same amount of time. At the end of 10 weeks, the yoga group showed significantly improved scores for positivity and lowered scores for aggression and counterproductive work activities compared to the control group. Yoga has also been shown to lower levels of cortisol — the stress hormone — as well as perceived stress in ways likely to make for a more serene workplace. Stress in the workplace diminishes performance and can lead to physical injury , including back pain, neck and shoulder tension and carpal tunnel syndrome — and that costs money. Yoga at the workplace has been shown to reduce absenteeism from sickness or other physical problems, to boost company morale and improve communication skills among employees. In addition, employees who took lunchtime yoga classes at two office sites in California reported a steep decline in stress and musculoskeletal pain. What Are the Benefits of Chair Massage in the Workplace?